One of my favorite cold weather accessories has got to be the beanie! I think it looks great on both men and women and it's an easy way to look cool, without having to do your hair! Gotta love that! I just bought this beanie in coral but also want a neon pink beanie sort of like this! The good news is that there are a ton of beanies out there! If you need some help, here are some good places to look: HERE, HERE (15% off too) or HERE! All of those places also offer Men's beanies so guys what are you waiting for, go get yourself a beanie! Oversized clutches have been "in" for a while, but it wasn't until I saw the picture above that I really noticed how well it can pull an outfit together. An oversized clutch can seem almost frivolous, given the fact that it isn't quite big enough to hold everything. Yet, somehow it seems like the right size to hold necessary things, making it the perfect addition. Find the clutch above by clicking here! I love the recent trend of pairing sneakers with different everyday outfits. While my tendency is to lean towards a pair of heels I think I am going to try and emulate this cool laid back look. This looks like an easy trend to pull off but there are so many different types of sneakers out there. From observation it looks like low profile sneakers work best with skirts and fun colors work well with jeans. It seems like any sneakers you choose should be safe unless they are actually made for working out in which case you could end up looking like you stepped out of an 80's aerobic class. Therefore invest in an everyday pair of sneakers to pair with skirts and jeans and keep your workout sneakers for times when you are actually being physically active and you should be good! I think I am going to try this look soon....wish me luck! Puma, New Balance and Nike tend to have some really fun colored sneakers. I found these and these both in cool colors. There are lots of low profile sneakers out there that are cute but I tend to gravitate towards this classic pair. This fun blue pair is even on sale right now! Check it out! Winter has officially arrived and it is COLD outside! It's time to get snuggled up in something warm and what better way than a nice big furry coat! Maybe it's the kid in me, but I just can't help but touch furry coats when I see them in stores. It just feels so nice! Being an animal lover though I don't think I can bring myself to own or justify having a real fur coat, but that is exactly why faux (the French word for fake) exists! It will keep you just as warm and feel fuzzy without harming any animals. The plus to faux is that it is also much more affordable. Regardless of what your preference, on this very cold day I hope you find yourself warm and cozy! If you are interested in a faux furry coat I found this TopShop coat. 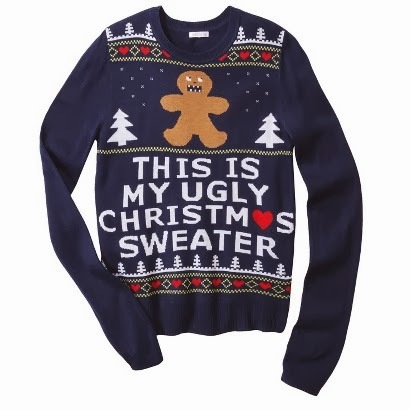 It feels lovely and comes in multiple colors, including white, yellow, blue, and of course black! Clothes are a necessity, but it's important to also have fun with it! I saw the picture above and was immediately inspired to find some fun printed dresses! Of course I gravitated towards this flamingo printed dress, but they didn't have my size so I immediately found this one, reminding me that sometimes you have to just go for it before its gone. If flamingos aren't your thing, try looking through this site! They always seem to have a variety of fun printed dresses in all sizes! Hope everyone had a great Thanksgiving! Over the holiday I went to go see the new Hunger Games movie, "Catching Fire". I was really excited to see it because of the costumes! I had been hearing great things and needless to say I wasn't disappointed. 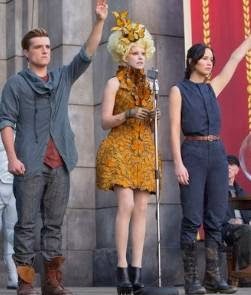 Effie's Butterfly Dress was amazing! Interesting fact: It was an Alexander McQueen real archive that they were allowed to borrow. 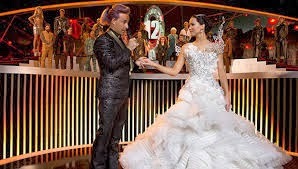 Katniss' Wedding Dress was gorgeous and with help from CGI effects caught on fire to transform into something magical (I won't ruin it for those who haven't seen the movie). In the movie, the Capital has an insatiable palette for food, drink and of course fashion! It's fun to imagine the crazy style that people in the capitol would wear. Trish Summerville, the costume director did an amazing job! In fact, I recently discovered that she created a small line of Hunger Games inspired apparel for Net-a-porter.com. If interested, you can find the collection by clicking here! My favorite from the collection was this one!